Alcatraz operated as a U.S. penitentiary for nearly 30 years before closing in 1963. 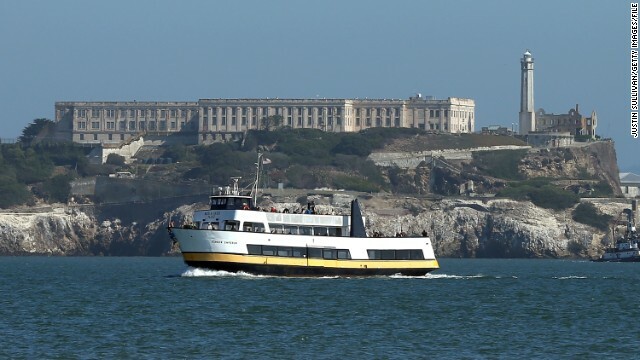 Alcatraz Island is in San Francisco Bay. 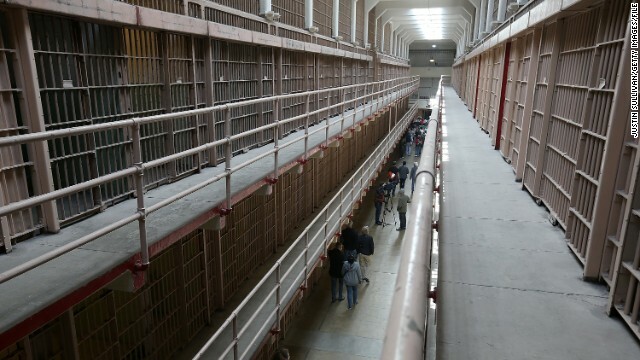 Tourists walk through the main cell block at Alcatraz Island in March 2013 as the National Park Service marked the 50th anniversary of the closure of the notorious prison. 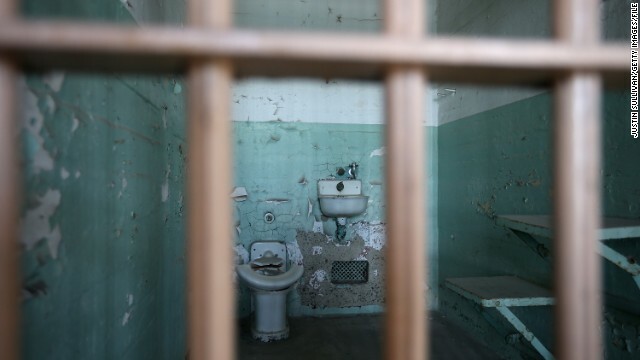 A view of a cell at Alcatraz. 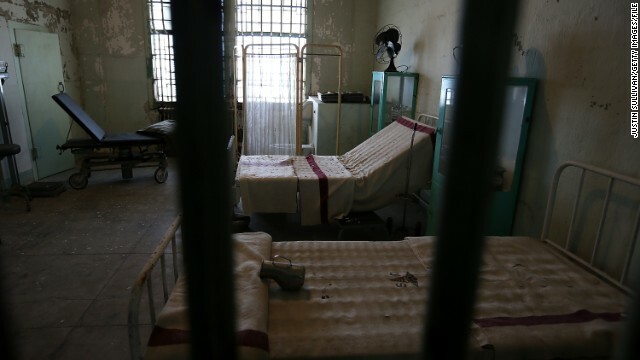 Here's a room in the former hospital at Alcatraz Island. 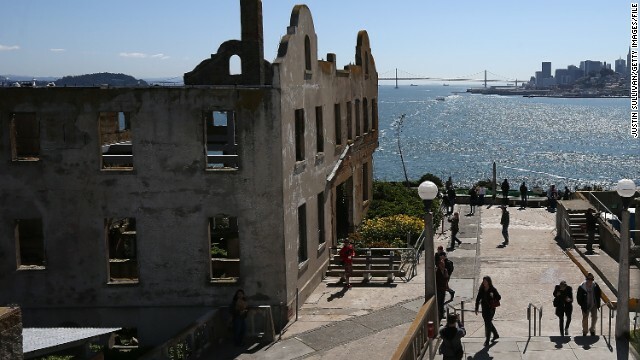 The former warden's house at Alcatraz Island stands in partial ruin. Alcatraz was a military fort before it became a federal penitentiary in 1934. 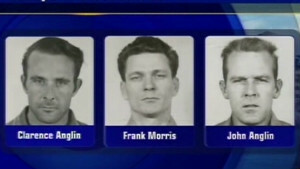 (CNN) -- On June 11, 1962, three Alcatraz inmates -- John Anglin, Clarence Anglin and Frank Morris -- attempted to leave the infamous San Francisco Bay island prison in a bold escape attempt involving dummy heads, chipped-through walls and a raft made of raincoats. For years, Alcatraz aficionados -- not to mention the authorities -- have wondered whether the trio could have survived the attempt and made it to freedom. Now a Dutch study has shown that, if their timing was right, the inmates just might have done so. Based on models of tidal currents in the bay -- and inspired by an episode of the Discovery Channel's "MythBusters" -- the team of researchers showed that if the Anglin brothers and Morris left Alcatraz at midnight and headed north, they could have reached land. "If they hit it exactly at midnight, the beautiful thing is that we see that they would have been sucked out towards the Golden Gate Bridge," Rolf Hut, one of the researchers, told the BBC, which first reported on the study. "But the moment they were close to the Golden Gate would have been the moment the tide reverses. And that would give them a moment of slack tide, in which they could have reached marine headlands in the northern site of the Golden Gate Bridge," he said. The window, however, was narrow, Hut observed. If the three left before midnight, the tides would have pushed them toward the ocean, where they would have died of hypothermia, Hut said. And if they left after 1 a.m., the tides would have pushed them toward the East Bay, and they also would have probably died of hypothermia in the cold waters. Hut allows that they could have survived the latter departure, though they were likely to have been picked up by police since they would have made landfall after sunrise. Only one person, John Paul Scott, is known to have survived an Alcatraz escape attempt, and he was captured the next day. However, Scott's successful swim across the channel to San Francisco -- six months after the attempt by the Anglins and Morris -- made it feasible that others could have done so as well. It's unlikely, though possible, that the Anglin brothers and Morris are alive today if they survived. Clarence and John Anglin, who were bank robbers, would be 83 and 84, respectively. Morris, who had an extensive record, would be 88. Still, the case has remained open. At the time of a 2009 NPR report, the U.S. Marshals Service was still investigating the case, and though the FBI ended its investigation in 1979, a note on an archived FBI web page devoted to the case says that any leads can still be called in. Alcatraz Federal Penitentiary was closed on March 21, 1963. It's now a National Historic Landmark and is open to visitors. A time capsule buried by patriots Samuel Adams and Paul Revere more than two centuries ago was unearthed in Boston. A notebook full of work-in-progress versions of key Dylan Thomas poems has been found more than 70 years after his mother-in-law ordered it be burnt. Oldest surviving photo of a human? At first glance, it doesn't seem that remarkable: A black-and-white scene of a strangely deserted city, smudged by primitive photographic process. People doodled in medieval times in a similar way to how they doodle today. New clue in Amelia Earhart mystery? An aircraft recovery group says it may have a part of Amelia Earhart's plane, and it thinks it knows where to find the rest of it. A World War II German U-boat, sunk during the Battle of the Atlantic more than 72 years ago, has been discovered off the coast of North Carolina. King Tutankhamun's mummified remains tell only a partial story of an ancient Egyptian boy king who died under mysterious circumstances. Even death couldn't part two skeletons excavated from a lost chapel in an English county, found with their fingers entwined. 150 years ago, mourning was a reason to stash away one's current best and purchase a whole new grief-appropriate wardrobe. Richard III was the last English king to lose his life on the battlefield. Scientists now believe they know how he died. A team of archaeologists has recovered new treasures from one of the most mysterious shipwrecks of all time. Nick Glass visits the 'Downton Abbey' castle and delves into its history as a WWI hospital. Delicate, rare and striking - forgotten photographs of black Britons in the late 19th and early 20th century have been unearthed. One of the most famous tragedies of the Northwest Passage sea route around the top of North America might have finally been solved.